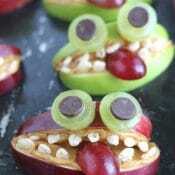 Apple Mummies - A Healthy Halloween Treat! The other day, my son was at the kitchen sink, peeling apples for a recipe he was making (we’ll talk about that later, wink wink). I was sitting at the breakfast bar, trying hard to seem as though I wasn’t watching over him (although … ahem … I might have been watching just a little). As he worked, the strips of brightly colored apple peel fell into the sink. “You know, this kinda looks like …” he suddenly said. And actually, I did know! I knew exactly what he was thinking, before he’d even finished his sentence! The apple he was peeling (in the messy, haphazard way only a 12-year-old boy could possibly manage to peel an apple) looked kinda like … a mummy! “You should …” he began again. But I was right there with him! Yes, I should! I should totally share this idea on THK! When I tried this little project myself a couple of days later, I wanted to be sure that it really was easy … and that someone who is completely lacking in art skills (notice that I am not mentioning my own name here!) could actually use a veggie peeler to make an apple look like a mummy. 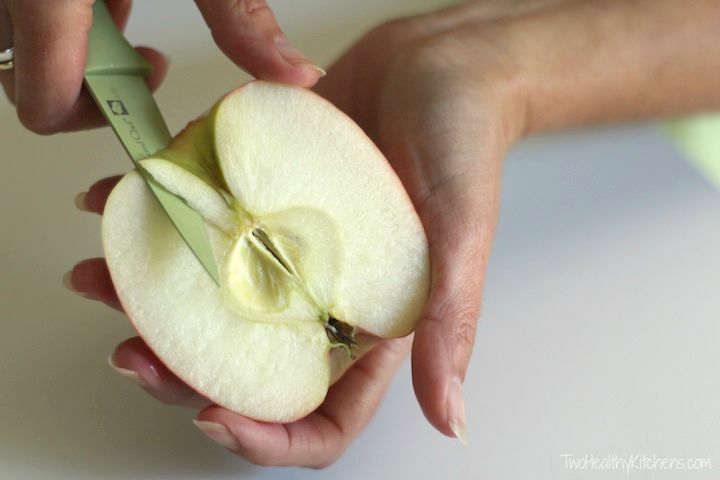 Before grabbing the peeler to “mummify” your apple, use a paring knife to remove the core. This definitely is THK-easy! If I can do it (on my first try! ), you for sure can, too! Ok, I think you get the picture! They’re cute no matter what you do with them! And so nutritious, too! 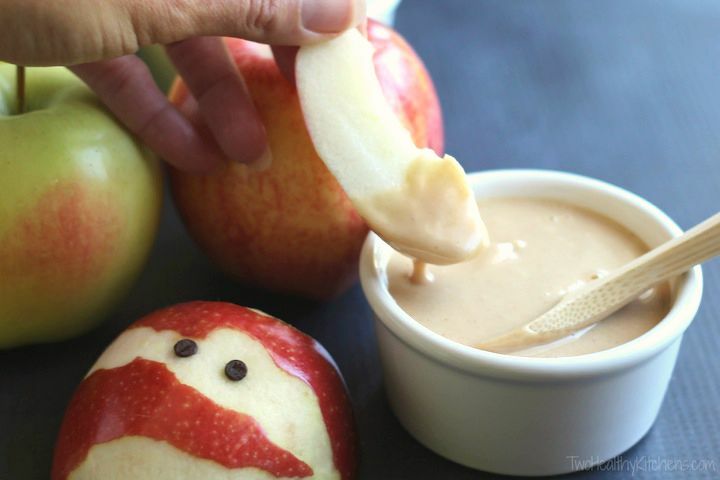 To turn this yummy, healthy Halloween snack into an over-the-top treat, serve your mummies with Peanut Butter Silk Pie Dip (an apple’s best friend – really!) or Sugared-Vanilla Fruit Dip. 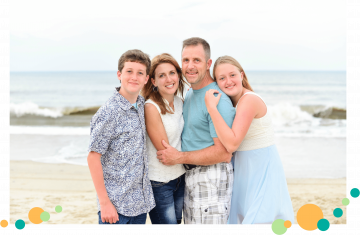 Mummies love ’em … and your kiddos will, too! Some apples turn brown (due to oxidation) much more quickly than others after they’ve been peeled. Sure, there are various tricks (soaking in an acidic liquid like water with lemon juice, etc.) 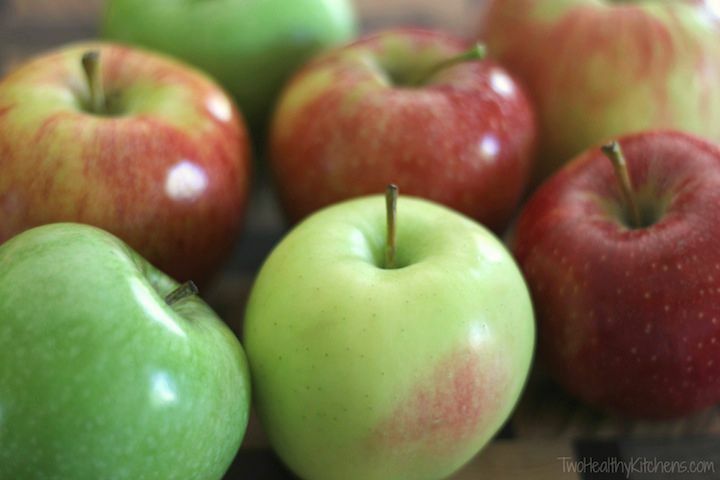 to keep apples looking fresh longer, but we’re generally in too much of a hurry for that! 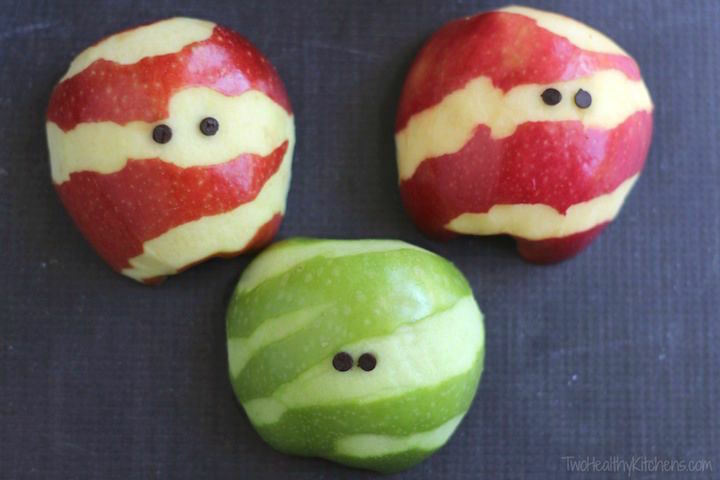 We just recommend that if you’re going to use these Apple Mummies to decorate a fruit tray or as a snack at a party, choose apples that don’t turn brown quite as quickly. Granny Smiths, for example, generally start to brown almost immediately, while Pink Ladies and Honeycrisps can sit out for hours and still look pretty fresh. We love serving our Apple Mummies with a healthy fruit dip! Try noshing on mummies with both our Healthy Sugared-Vanilla Yogurt Fruit Dip and our Peanut Butter Silk Pie Dip with Greek Yogurt. Both dips require only four super-common ingredients and take about five minutes (tops!) 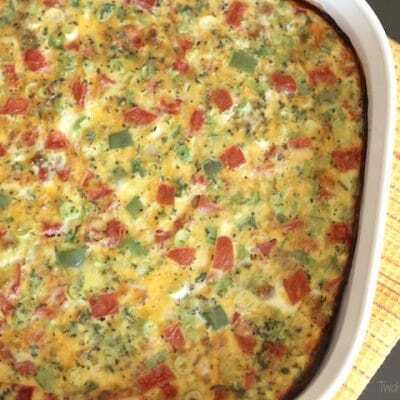 to whip up … but they’ll make you look like mom of the year when served with your perfectly sculpted mummies! 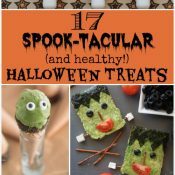 … plus our Healthy Halloween Recipes board on Pinterest! Terrifyingly terrific, no doubt! Cut each apple in half vertically and carefully remove the core. Starting at one edge, use a vegetable peeler to remove haphazard strips of apple peel. Lay each apple half on a plate or serving tray and press two eyes into the apple in an area where the peel has been removed. If you're using mini chocolate chips, push the pointy end in first. If you're using dried blueberries, it may help to use a paring knife to make a tiny divot in the apple where you want each eye to go, and then gently press the blueberry eyes in. Some apples (such as Granny Smith) tend to turn brown more quickly than others after they've been cut. If you need your apples to look fresh for a while (on a fruit tray for a Halloween party, for example), you may want to choose apples that don't turn brown quite as quickly (such as Pink Ladies and Honeycrisps). We’d love for you to submit any other kid-friendly craft tutorials you have. Thanks for another awesome project idea! I just picked up 6 bushels of apples from my parents…I can’t wait to show these to the kids! Love this idea! 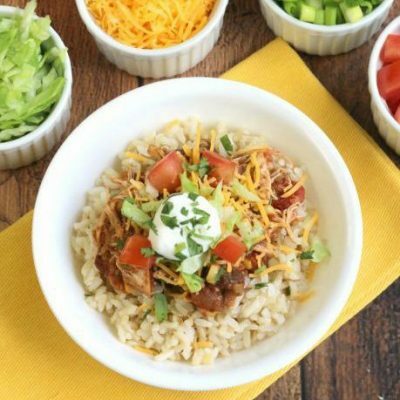 It’s so simple but kids will love it!! So simply and so fun! I love the idea. I really love these and what a great idea! Who wouldn’t want to eat one of these – I know I would! This is too clever! and funny! 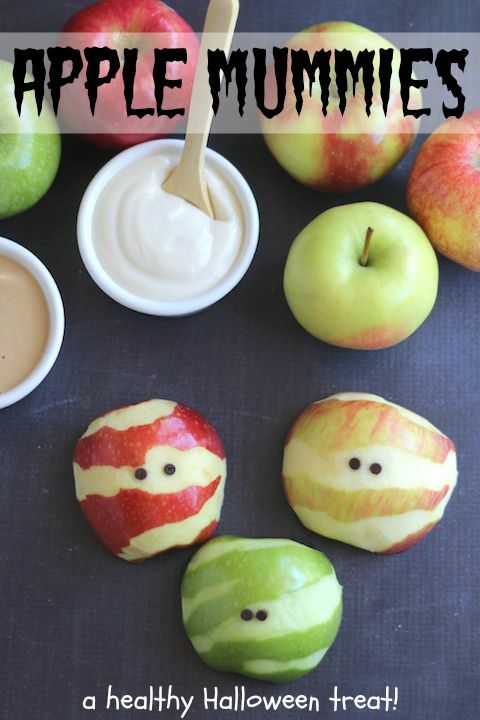 What a great way to make healthy food fun and festive! 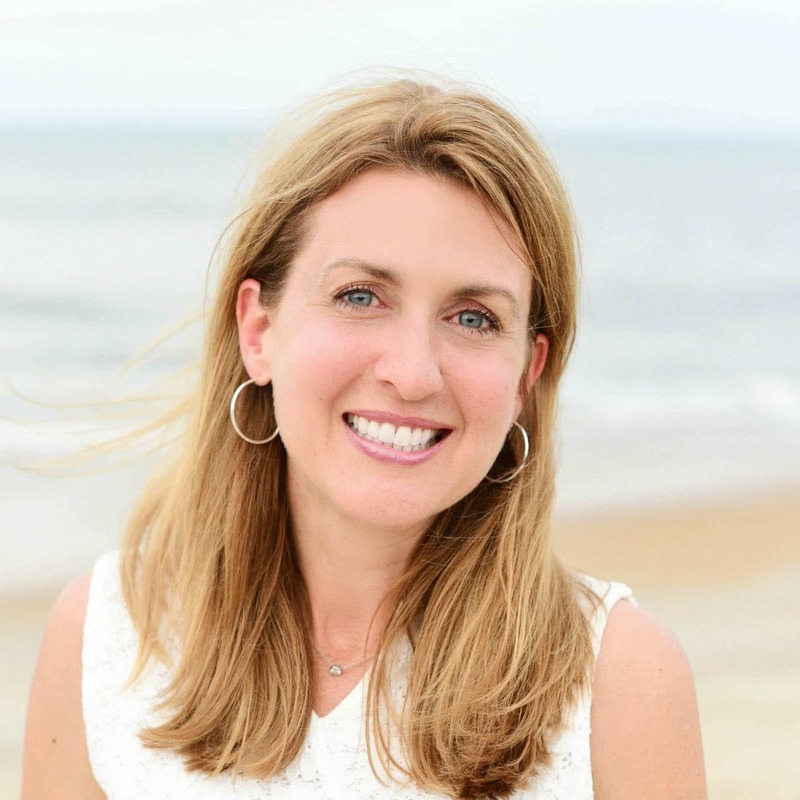 Oh, Stephanie! 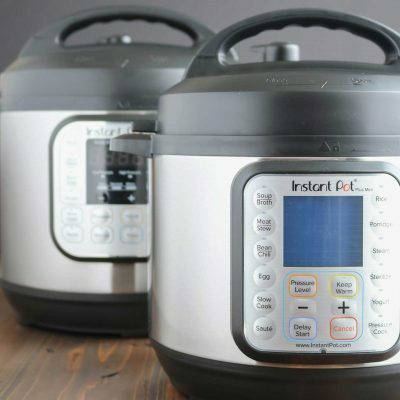 These will be the perfect addition to your party!! Quick tip – if the snacks will be sitting out for a bit, be sure to choose an apple that doesn’t brown as quickly as others. We found that Honeycrisp and Pink Lady apples stayed looking their scary best for hours!! Super Duper cute! I love Halloween! And, I’ll definitely be pinning this for when Kiera’s a bit older and can appreciate how cute these are! Thanks for the great idea! Hahaha! These are so perfect and adorable! I love how they look just like little mummys! Thanks for the smile today – I am loving these. Oh, don’t these just look adorable! 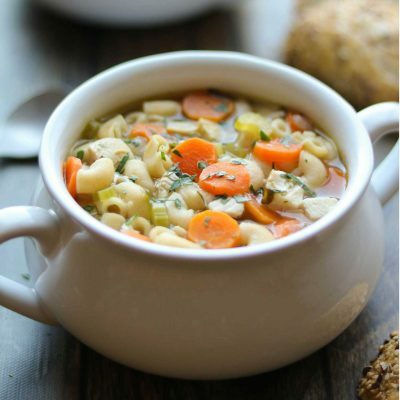 I love everything about them – they’re healthy, quick and easy and, I would have thought, pretty much fool-proof. Nice one, girls! Ohh, they’re so nice and cute! Such creativity, Shelley and Gretchen! I also love to think of great ideas for Halloween. It wasn’t much celebrated when I was a kid, so I’m making up for lost time now, hehe! 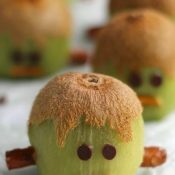 I love these Apple Mummies! 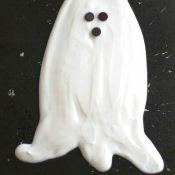 We’ll make some with chocolate chip eyes! Please pass the fruit dip!